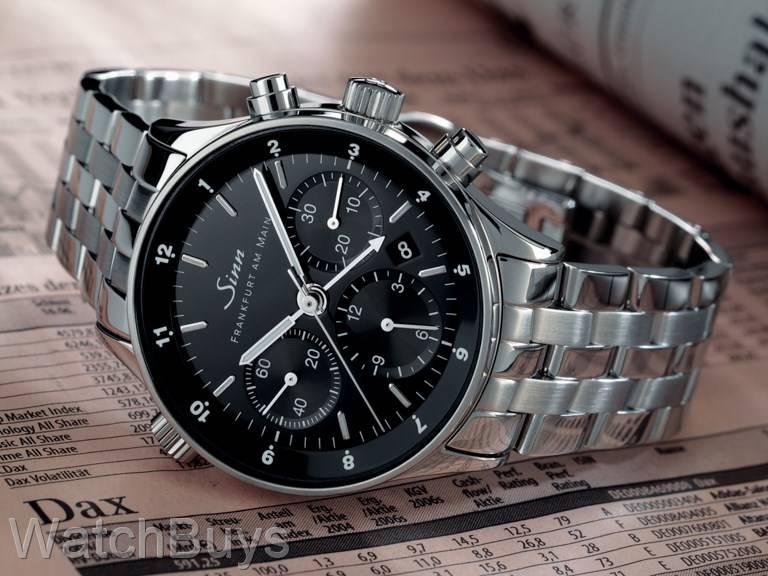 This watch is referred to as the Frankfurt Finance Chronograph, and features three time zone displays with chronograph. The additional two time zones are achieved first by a second hour hand, and next by a rotating inner bezel set by a crown at 10. Polished stainless steel case on bracelet. Watch features matte black dial with applied silver markers, luminous hands and sapphire crystals on both sides. This watch is water resistant to 100 meters. This watch comes in an elaborate wooden presentation box which includes the bracelet, strap, tools, loupe and polishing cloth. Verified Owner Comments: I was impressed with this watch for over a year looing at it on the internet. Seeing the watch face to face blew me away. I am extremely overwhelmed by the workmanship, quality and style that just can't be demonstrated on a computer screen. The elegant box, tools, straps, etc. was a very nice touch that you have to see. I have many watches including a nice Rx, and this is my watch of choice for fine dining, business or casual wear. The manual is very helpful for setting the 3 time zones and dates. Rob at Watchbuys was very helpful and a pleasure the do business with. Got my watch in less than 24hrs. Absolutely love this watch and wonder why I waited so long to buy it!!! Verified Owner Comments: Owned this watch for a year now and it never failed to amaze me with its accuracy -1second/day. Truly stunning piece for work wear and casual wear. Love it! Love it! Love it! Verified Owner Comments: If you own one mid size watch this is the one to buy. Three time zones, date window, ss and leather bands included, automatic, water resistent at a fair price. Only issue for me is that I wish it were a little larger.